Judith Nash Swanson, 74, died Saturday, February 2, at Carle Foundation Hospital in Urbana, IL, of surgical complications. Cremation rites have been accorded at her request. A memorial service will be held on at 4 p.m. on Saturday, February 9 at Morgan Memorial Home, 1304 Regency Drive West, in Savoy, IL. The family will receive guests from 3 to 4 p.m.
Judith was born on March 15, 1944, in Chicago to Clarence and Jessie Faro Nash. She was baptized and confirmed at Pennsylvania Avenue Baptist Church and was a member for many years. 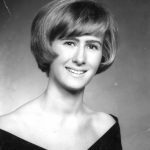 In 1962 Judie graduated from Urbana High School and the University of Illinois in 1966, with degrees in Physical Education and Recreation and Municipal Park Administration. She also earned master’s degrees in Education, Guidance Counseling and Psychology from Western Illinois University. She worked part-time while raising her two children. Judie loved being outdoors and teaching swimming lessons in and around the Woodhull area. Later in life she served as a guidance counselor and psychology teacher in the Monmouth and Watseka school districts. Judie had a strong sense of community was proud to serve on various civic committees. She was a loyal Illini fan and enjoyed spending time on campus, particularly during her time as house mom at Pi Beta Phi. Survivors include a daughter, Tiffany Swanson and her husband, William Hoehn, of Annandale VA, and their children, Margaret and Andrew; a son, Tadd Swanson, and his wife, Monica, of Mapleton, IL, and their children, Nicholas and Annie; sisters Dorothy Reynolds and her husband, Floyd, of Urbana, IL, and Linda Myler and her husband, Bernie, of Monticello, IL; and many nieces and nephews. Her parents and an infant sister, JoAnn Nash, preceded her in death. Memorials may be made to Salt and Light Ministries, 1819 South Philo Road, Urbana, IL 61802, and/or the Champaign County Humane Society, 1911 East Main Street, Urbana, IL 61802. Judy was a wonderful woman who helped me in many ways in my pre-teens and through the high school college years. She was the one who turned swimming into a passion instead of a chore. Also when I finished all the classes that I could take at the pool, she allowed me the ability to help with the beginners. When I was 15, I became a lifeguard and followed with my WSI to be able to continue to work at the pool and teach lessons. I have often heard her voice in my head when I had to overcome a challenge with the belief I could do it. Tiffany, thank you for sharing your mom with so many kids and me throughout the years. She was a wonderful person. I was working with her from 1979-1985ish. Judy was a wonderful woman who influenced me so much in my pre-teen years. She was my swim instructor that changed it from a chore to a passion. When I surpassed all that I could do at the pool, she allowed me to be an assistant to teach the beginners. I became a life guard at 15 and swim teacher with my WSI. When ever I meet a new challenge it was her voice coaching me on. I appreciate her encouragement and teaching me to believe in myself. Tiffany thank you for sharing your mom with me and so many other kids.